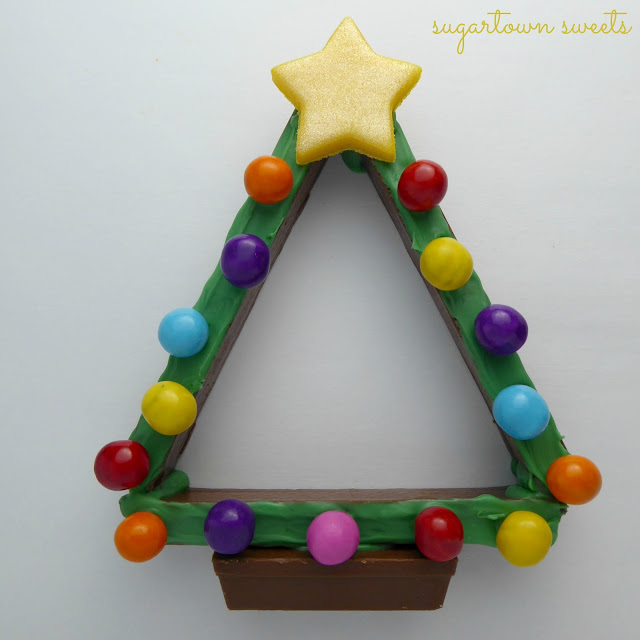 Sugartown Sweets: 3D Candy Christmas Trees For Christmas in July! 3D Candy Christmas Trees For Christmas in July! Today is my granddaughter, Princess Lydia's 4th birthday and it's been a great day of celebrating the blessing that she is to our family! 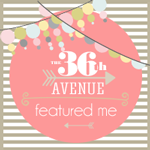 But I didn't want the day to get away before sharing my annual Christmas in July treat with you! My favorite thing about these trees is..they stand up! 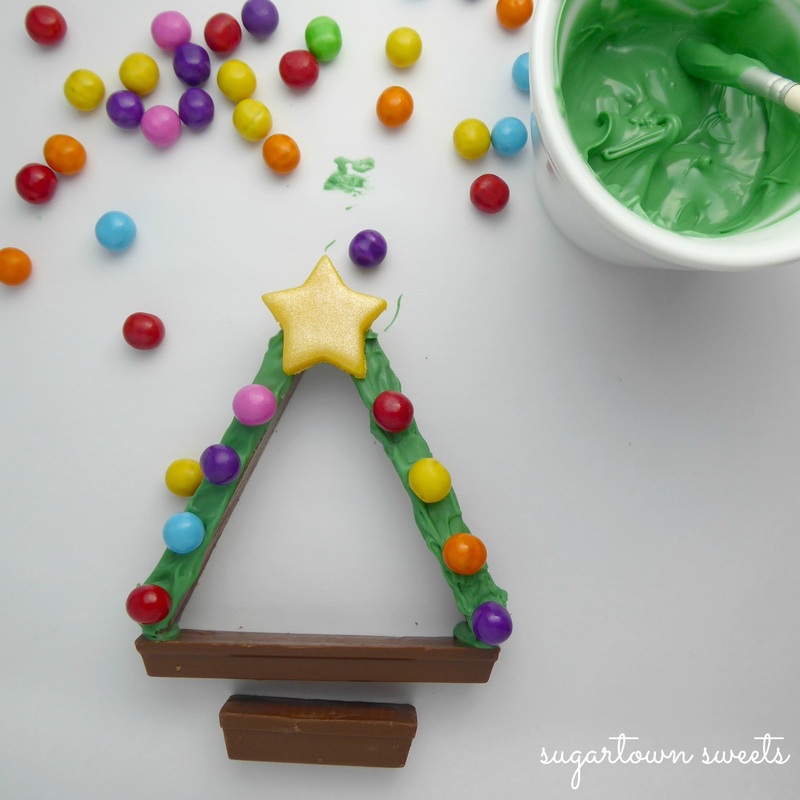 You can easily make your own Christmas Tree Farm holiday platter with these holiday cuties. Or you could place them at each setting as party favors! So last month I found the cutest little popsicle Christmas tree crafts online and thought they would be so sweet made out of candy. What do you think?! I was so happy with the way these turned out. When my granddaughter saw them, she declared, "Oh, those are nice"! 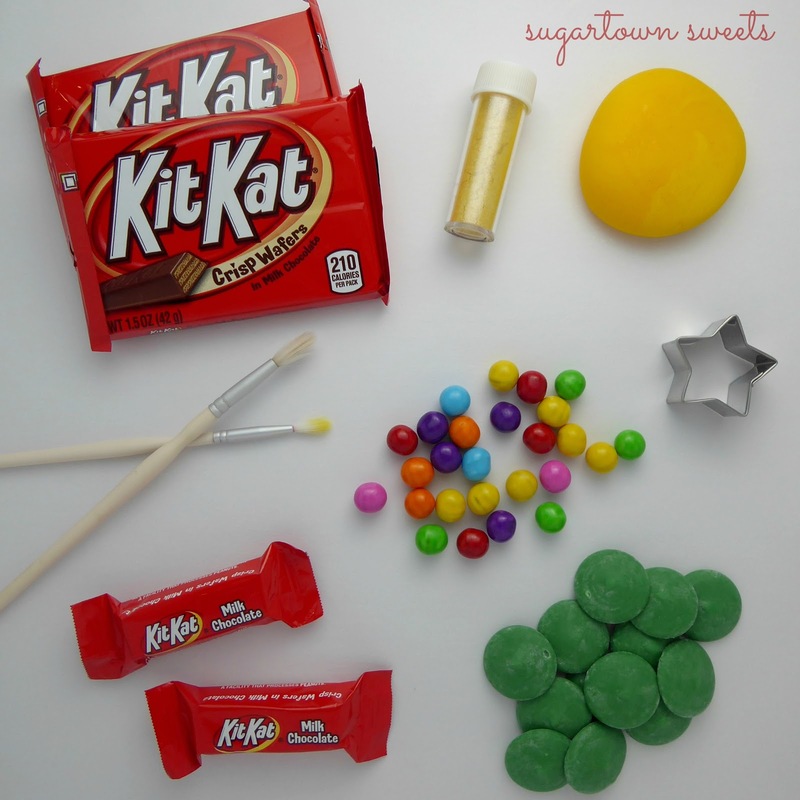 I used: Kit Kat bars, mini Kit Kat bars, green candy melts, sixlets, yellow fondant, and yellow pearl dust. 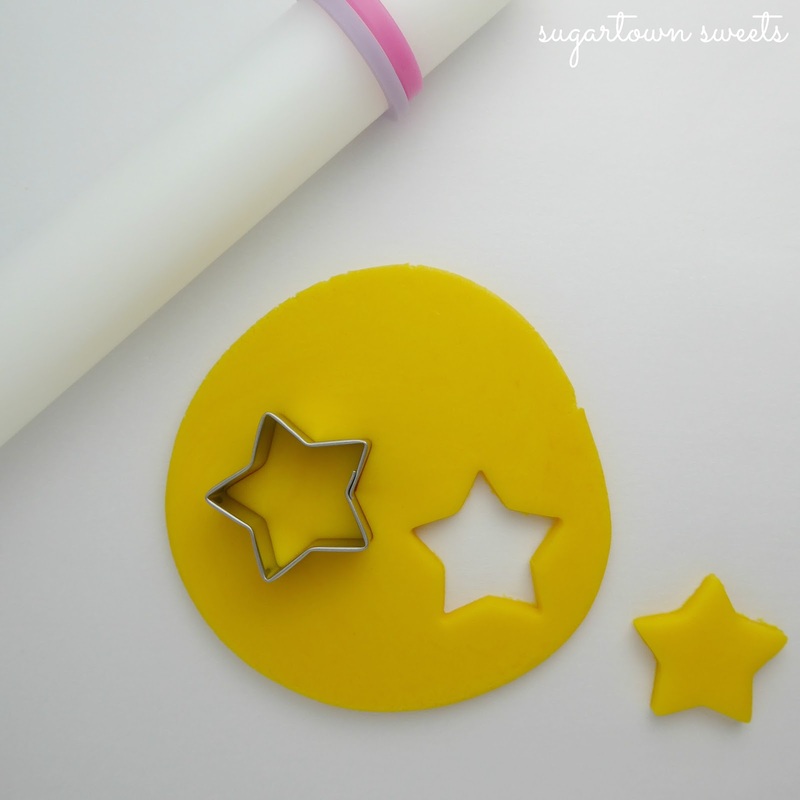 Tools I used were: small star cutter, food grade paintbrushes, and fondant roller. 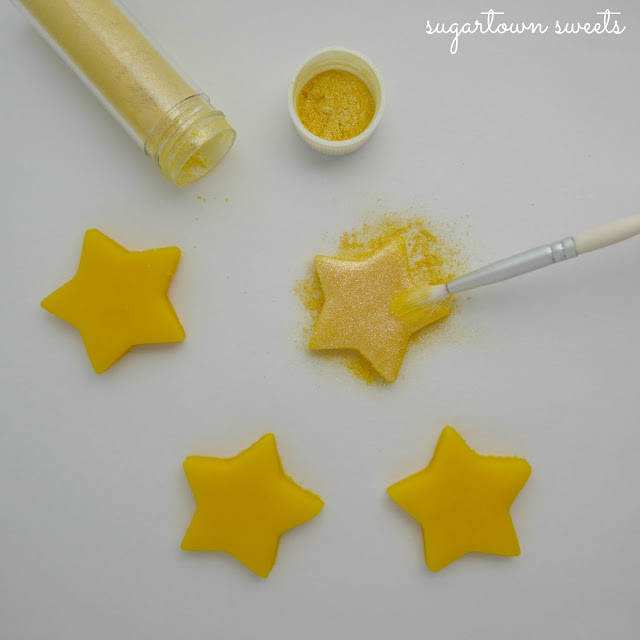 Roll out fondant and cut stars. In honor of Miss Lydia who loves all things sparkly, to the stars I added this pretty, yellow, pearl dust! Perfect! 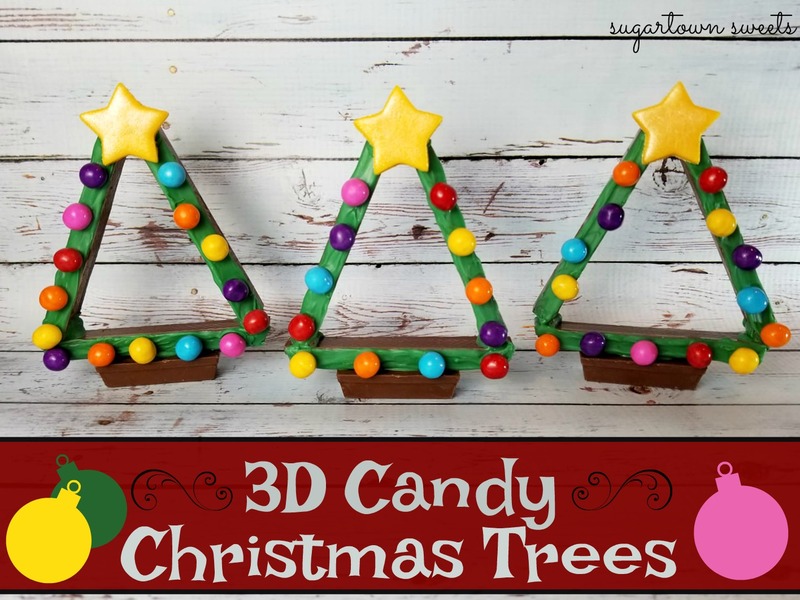 Assembling these candy trees is so easy! 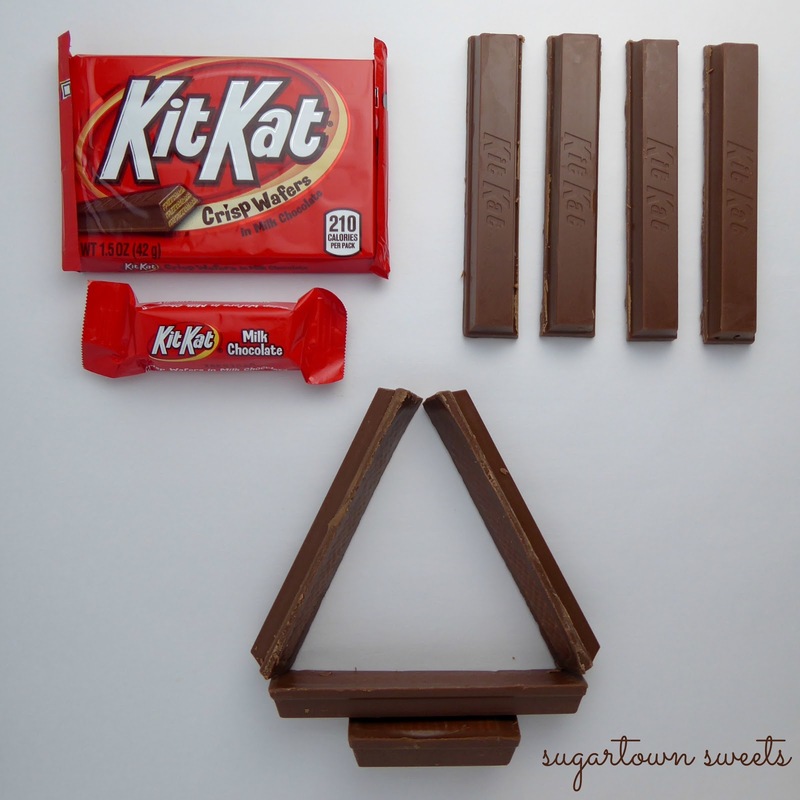 Cut or break, (i suggest cutting them to minimize breakage) Kit Kats into 4 sections. You will need 3 regular strips and one mini bar for each tree. Melt candy melts in the microwave. If they are too hot, wait a couple of minutes before applying to candy bars as they will melt the chocolate. 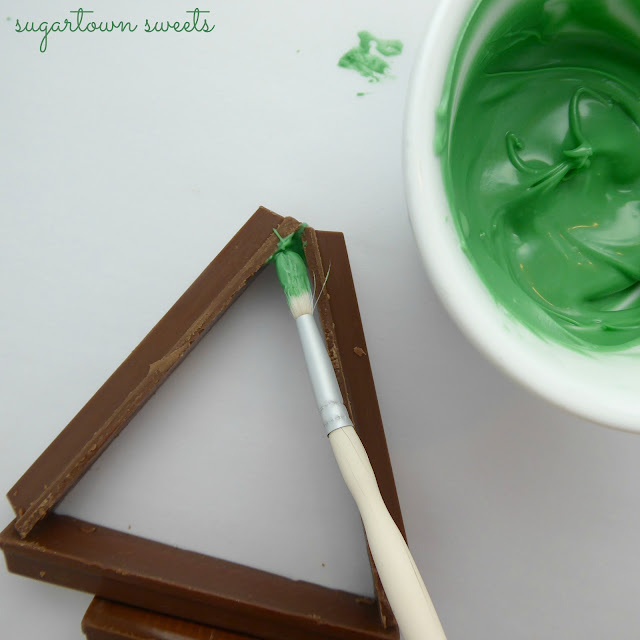 Using the paintbrush, apply melted candy to attach each section at the corners. Let set till hardened. Let's "perty up them trees"! 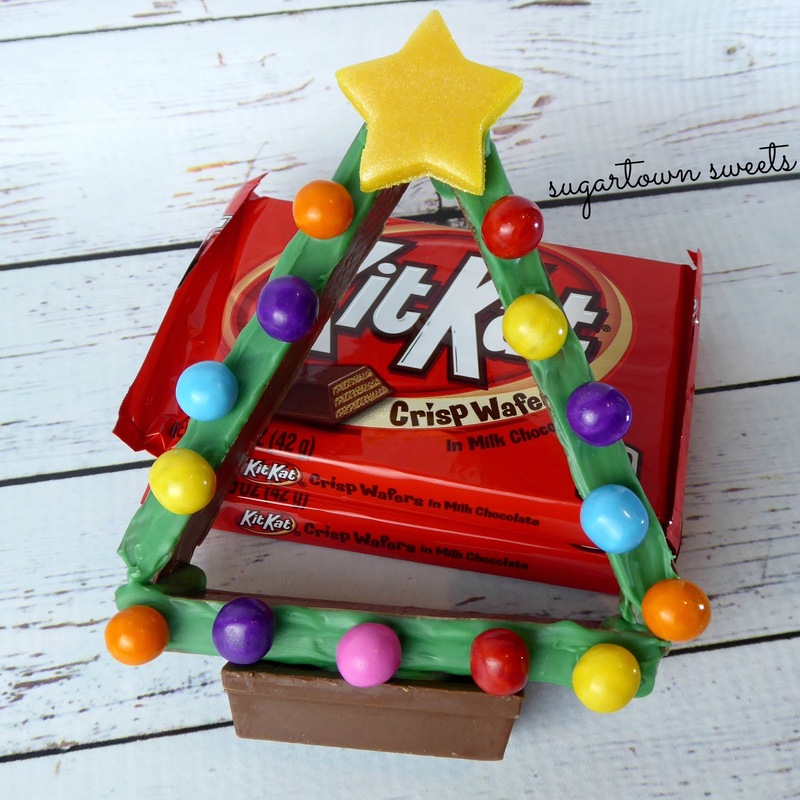 Paint the Kit Kat sections with green candy melts and place the sixlets candy Christmas tree lights. Attach mini candy bar trunk and fondant stars with a dab of melted candy. I love these festive colors! I have loved every minute of the Hallmark Christmas movies. I am not ready to let them go yet! But thankfully, the Christmas season is less than 4 months away! Thanks for stopping by and I wish you all a Happy July! You do the most creative things with Kit Kat bars! These Christmas trees are so cute. I have loved everything you've created with the Kit Kat Bar, but this is my FAV! oh christmas tree! oh christmas tree! 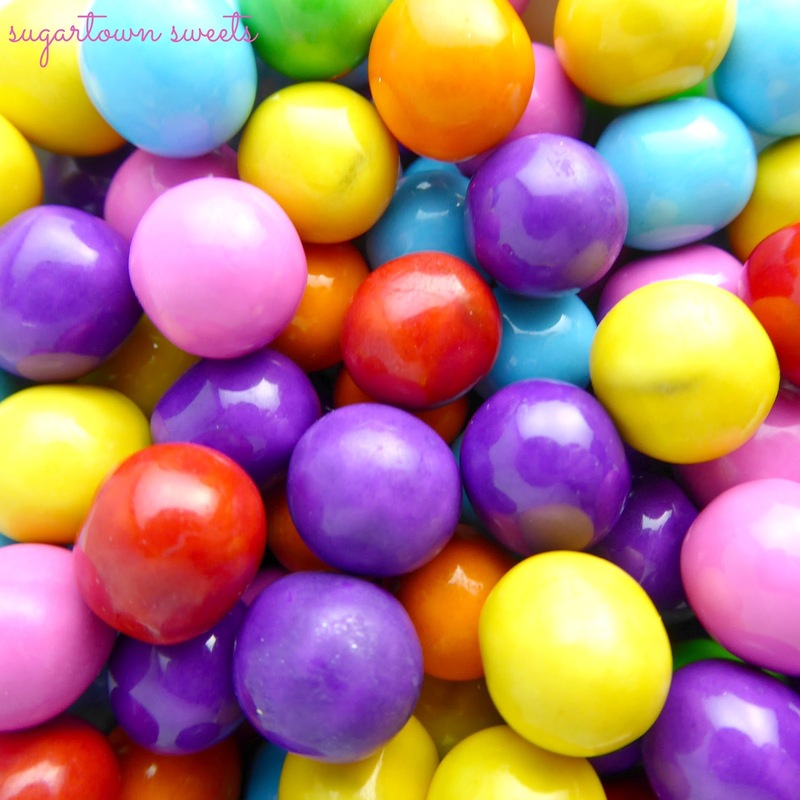 how lovely are your sixlets! 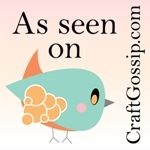 Sign Up By Email To See All New Posts By Sugartown Sweets! How to Make Hard Candy Jewels Using Melted Jolly Ranchers Candies! Tell your mom she’s as sweet as pie this Mother’s Day! Join Sugartown Sweets Today..We'll Have FUN!